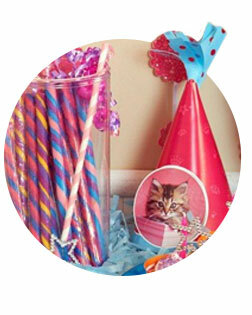 With Party Cats Party Supplies, your next big birthday bash is sure to look perfect for guests and the girl of the hour! Pretty kitties adorn items like napkins, cups, dinner and dessert plates, and table covers, and you can also get party favors like personalized zipper pulls, and decorative items like balloons, banners, and more. Get ready for pastel colors and feline fun! Who wouldn’t want a party full of cute and cuddly kittens? Invite a group of glamour kittens to your daughter’s next birthday party, and it’s sure to be a memorable experience. Skip the hassle of searching through party stores for matching supplies. You can find everything you need for the perfect Glamour Cats party right here! From the very first invitation to the last thank you note, the party planning is easy from beginning to end. Prepare for your little girl to frolic and play with her friends as she enjoys her special day. Since you’re having an animal-themed party, the more animals the merrier! Have your guests bring their favorite stuffed animal, whether it’s a cat, dog or any other furry friend. This will create the cutest photo opportunities while adding to your party décor. Can’t decide which games to play or how to decorate your delicious birthday cake? Visit the Birthday Express Ideas & Inspiration blog for endless party-planning tips and tricks. No matter which party theme you choose, you’ll be inspired to plan the best birthday party yet. 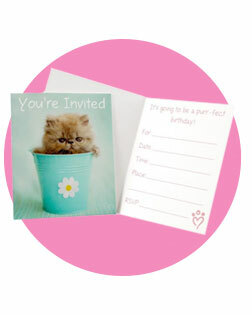 Send out these adorable kitty invitations to set the mood for your Rachael Hale Glamour Cats party. Don’t forget to tell your guests to bring their favorite stuffed animal. You or your daughter can even hand-write these notes for that extra-personal touch. The right decorations can make or break any birthday party. 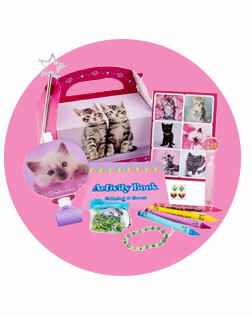 Make sure your little guests and their parents know it’s a Glamour Cats party from the moment they walk in. With Glamour Cat themed balloons, banners, plates, cups, napkins and more, you can purrfectly decorate any party area, big or small. Images of kittens cute enough to cuddle will be everywhere, putting a smile on the face of every guest. Every birthday girl deserves special balloons tied to her chair. These adorable Glamour Cat balloons are great for any kitten-lover. With furry friends featured on both sides, these balloons have your party décor covered. Make the day even more special with a high-definition, personalized banner. Featuring two glamourous kittens, this customizable banner showcases the sophisticated style of Rachael Hale Glamour Cats. Are you looking to make this the best and most complete birthday party of all time? Then you can’t forget the tableware. Tablecloths, plates, cups, plastic ware and napkins are all right here to create an excellent table setting. The kids will love enjoying their pizza, snacks, cake and ice cream accompanied by the cuteness of Glamour Cats. Kittens are playful, spirited creatures, so it’s only fitting that your Glamour Cats party would be full of games and activities. Your guests will love working together to make fun crafts, break open the piñata or color activity placemats. And don’t forget to involve their stuffed animals. There will be plenty of photo opportunities to capture the giant smiles on each and every little girl’s face. Amp up the excitement in the party area while adding to your theme. This adorable cat-shaped piñata will jazz up just about any birthday gathering. You’ll love seeing the kids’ faces light up when all of the yummy treats fall to the ground. Keep the little ones entertained, even when they’re sitting at the table! Set out these activity placemats and crayons at each place setting so each of your guests can enjoy some fun coloring and activities. Be the glamorous host you’ve always wanted to be when you send your guests off with an abundance of delicious and exciting party favors. With these party favors, your daughter’s friends will never forget all the fun they had! Make the memories last forever with take-home gifts that will even impress the other parents. Your guests will be talking about your party for weeks to come. Take the guesswork out of party favors with Filled Favor Boxes. Hand your party cats their goodies as they walk out the door and they’ll be delighted by your generosity. Give your guests their very own cat to take home! Well, cat figurine, that is. 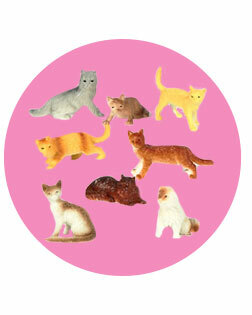 These assorted mini cat figurines are perfect to stick in take-home treat bags and boxes. Birthdays are one of the most special occasions in your daughter’s life, and you know she deserves the best. Go all out by personalizing each birthday decoration to show how much she means to you and your family. Add photos, names, sayings, and whatever you think would make her feel extraordinary. You can even preview each item before you order to make sure it’s absolutely perfect for the big day. Everyone will know who the birthday girl is with this personalized high-definition banner. Perfectly fitting your party theme, this banner will tell everywhere where the fun begins! Personalize these brightly colored plates with a picture or message just for the birthday girl. Your guests will enjoy and appreciate that you went the extra mile. Teach your daughter exemplary manners when you allow her to hand-write her own thank you notes. She’ll love being able to create these cards herself and her guests will enjoy the reminder of all their Glamour Cats memories.